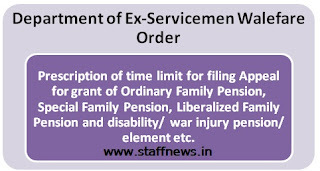 It has been observed that Service Hqrs are processing the appeal case files-(First Appeal/ 2nd Appeal] for grant of-Ordinary Family-Pension, Special Family Pension, Liberalized Family Pension and disability/War injury pension/ element etc after elapse of considerable time from the date of rejection of claim/ date of discharge or invalidment of the personnel from Service. 2. The matter has been under consideration of this Ministry for quite some time and President of India is pleased to decide that, a time limit of five years is prescribed for filing an appeal for consideration of the case for grant of Ordinary Family Pension, Special Family Pension, Liberalized Family Pension, disability/war injury pension/ element etc'from the date of discharge/ invalidment from service or from the date of rejection of claim. The time limit of five years prescribed in this order is applicable in the case of belated appeal only and the period of six months prescribed in the Pension Regulation and Entitlement Rules etc for filling appeals in respect of disability/ war injury element, special Family Pension etc would continue to be governed under the existing provisions. 3. The time limit of five years prescribed now will not be applicable in the case of delayed manifestation of disease and all such cases'Would continue to be governed under the existing previsions provided under regulation 86 of Pension Regulation for Army Part. I . 4. . Para 1(a)(vi] of Ministry of Defence Order No.4684/DIR(PEN)/2001 dated 14th August 2001 and Para 2(0) of Ministry of Defence letter No. 4684/Dir[Pen)/2001 dated 7th November 2001 maybe modified as "Time bar sanction for filing appealsfor all type of Family Pension and disability/War injury pension/ element etc in respect of officers and PBORS beyond twelve months to five years”. 6. This issue with the concurrence of Finance Division of this Ministry Vide their ID No PC-Z to 26(7)/2013/Fin/Pen dated 13/14 April 2016. Central Government Employee News and Tools: Prescription of time limit for filing Appeal for grant of Ordinary Family Pension, Special Family Pension, Liberalized Family Pension and disability/ war injury pension/ element etc.